The largest known terrestrial mammalian carnivoran of all time was (possibly) the South American short-faced bear (Arctotherium) source 1 source 2. Big males of this species would have weighed more than 1,500 kg (3,307 lb) and standing at least 11 feet (3.4 meters) tall on the hind-limbs. A specimen from Buenos Aires shows an individual estimated, using the humerus, to weigh between 983 and 2,042 kg (2,167 and 4,502 lb), though the authors consider the upper limit as improbable and say that 1,588 kg (3,501 lb) is more likely. 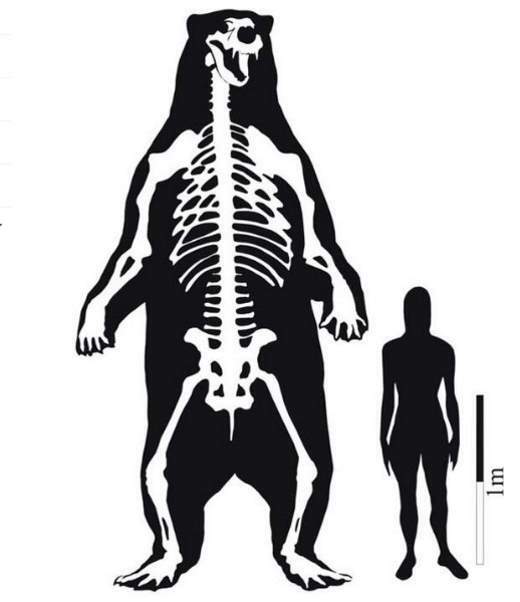 South American giant short-faced bear versus human size comparison. Photo credit: Soibelzon, Schubert, Journal of Paleontology. Previously, the Andrewsarchus was declared as the largest terrestrial mammalian carnivore known on the basis of the length of the skull. In popular culture,‭ ‬especially at the turn of the twentieth and twenty-first centuries,‭ ‬Andrewsarchus has been presented as a huge predator (13-foot-long, one-ton meat eater),‭ ‬similar in form to other quadrupedal meat eating mammals,‭ ‬but powerfully built like a big cat or even a bear.‭ ‬However despite this reconstruction becoming very familiar in the public consciousness,‭ ‬palaeontologists are far more cautious as so far only the skull of this animal is known. The heaviest known felid ever was the Ngangdong tiger (Panthera tigris soloensis) with the largest specimen weighing up to 470 kg (1036 lb). Also, the largest saber-toothed Smilodon populator males might have reached 470 kg. Read more: top five largest prehistoric cats. The largest canid was Epicyon (“more than a dog”), a large, extinct, canid genus of the subfamily Borophaginae (“bone-crushing dogs”), native to North America. 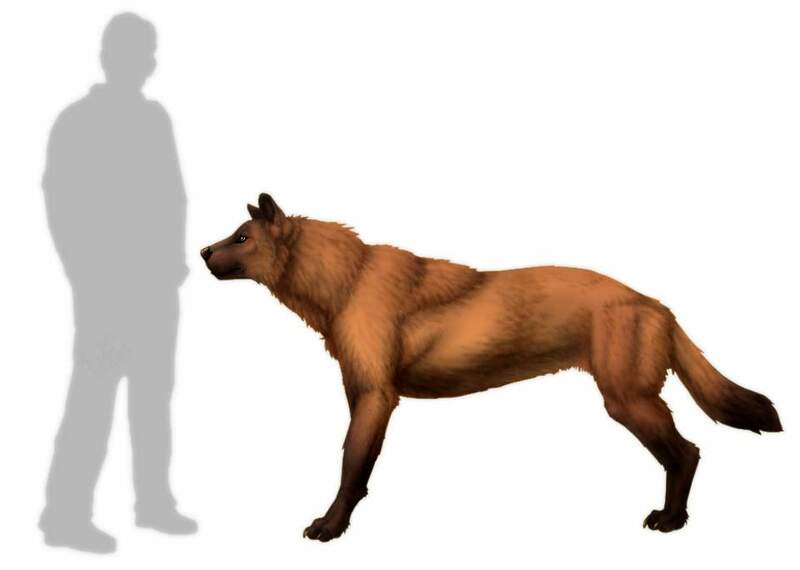 Stood at 37 inches tall (0.9 meters) at the shoulder, it was even bigger than the dire wolf (Canis dirus, “fearsome dog”), the largest wolf ever. Epicyon was about 5 feet (1.5 meter) long and had an estimated weight of 150 lbs (68 kg). Some sources state 200-300 pounds (90-136 kg). It had a massive head and powerful jaws, giving its skull a lion-like shape rather than that of a wolf. Size comparison: Epicyon vs Dire wolf vs Gray wolf vs 1.8 meter tall person. The largest “bear dog” was Pseudocyon. They inhabited Eurasia and North America during the Miocene epoch living approximately 5.3 million years. The largest fossil find was of a mandible (F:AM 49247) founded in New Mexico. The mass estimate derived from the mandible was about 773 kg, representing a very large individual. 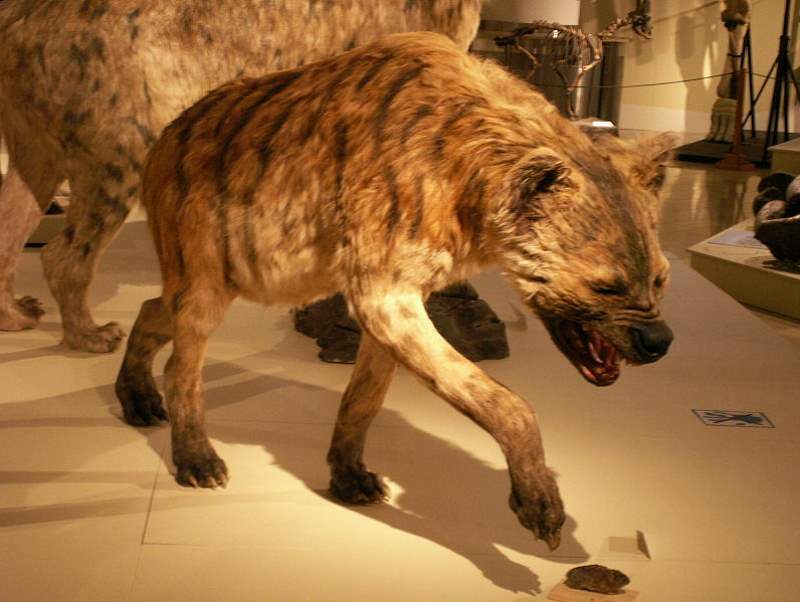 The largest known fossil hyena is the Pachycrocuta brevirostris, colloquially known as the giant hyena as it stood about 90–100 cm (35–39 in) at the shoulder and it is estimated to have averaged 110 kg (240 lb) in weight, approaching the size of a lioness, making it the largest known hyena. According to some sources including wikipedia, the largest known land mammal ever was a proboscidian, Palaeoloxodon namadicus, or the Asian straight-tusked elephant that ranged throughout Pleistocene Asia, from India (where it was first discovered) to Japan. This animal was of 5 meters (16 ft) tall at the shoulders and 22 tonnes (24 short tons) in weight. African bush elephant (Loxodonta africana) vs Palaeoloxodon namadicus vs 1.8 meter tall human size comparison. What about mammoths? The largest individuals of the steppe mammoth of Eurasia (Mammuthus trogontherii) estimated to reach 4.5 meters (15 ft) at the shoulders. Larger than today’s largest land mammal, the African bush elephant, which can reach 4 meters at the shoulders, but smaller than the Palaeoloxodon namadicus. The largest known Even-toed ungulate (artiodactyl) was Hippopotamus gorgops with a length of 4.3 metres (14 feet) and a height of 2.1 meters (6.9 feet). With a weight of 3,900 kilograms (8,600 lb), it was much larger than its living relative, Hippopotamus amphibius. Today’s male hippopotamus adults average 1,500 kg (3,300 lb) in weight and they reach 1.5 meters (4.92 feet) at shoulder. The tallest ever even-toed ungulate is not extinct: it is giraffe. With a height up to 5.7 meters (18.7 feet), it is also the tallest living terrestrial animal. 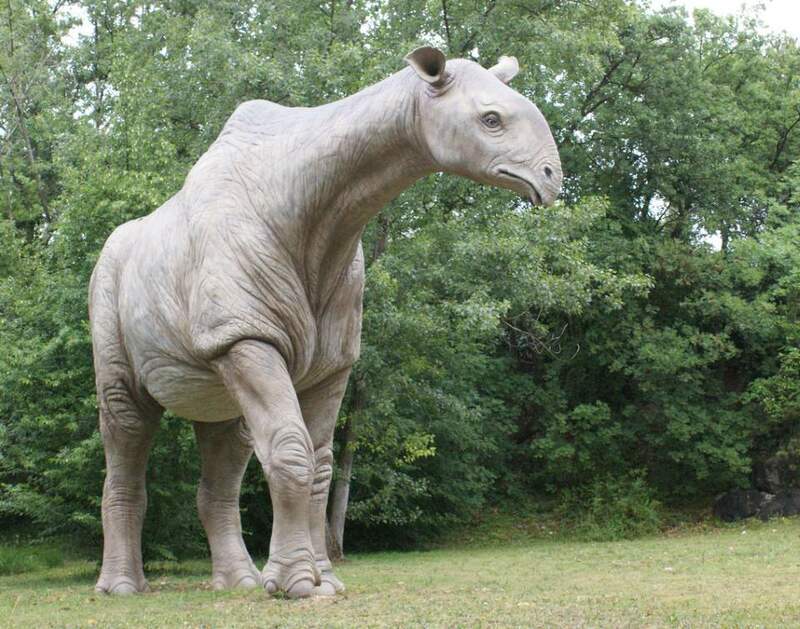 The largest known Odd-toed ungulate (perissodactyl), and the second largest land mammal ever, was Indricotherium (also known as Paraceratherium). 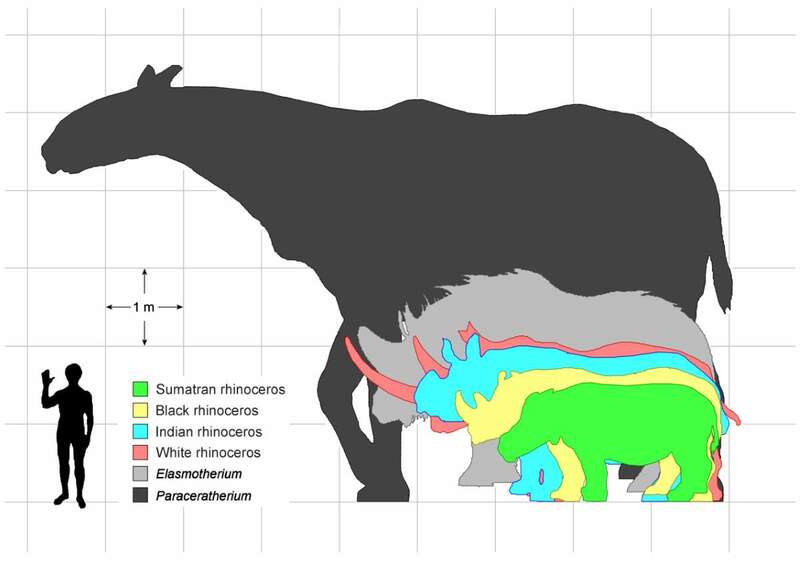 The exact size of Paraceratherium is unknown because of the incompleteness of the fossils. The largest individual known was estimated at 4.8 m (16 ft) tall at the shoulders, 8.0 m (26.2 ft) in length from nose to rump, and 16–17 t (18–19 tons) in weight. Many sources, including Encyclopædia Britannica claim that the Indricotherium was the largest land mammal ever. According to the Britannica, it stood about 5.5 meters (18 feet) high at the shoulder, was 8 meters (26 feet) long, and weighed an estimated 30 tons, which is more than four times the weight of the modern elephant. If this sizing is true, this means it was even approaching the size of the giant sauropod dinosaurs that preceded it by over a hundred million years. There was also a giant rhinoceros (Elasmotherium). It was almost the size of a mammoth. The known specimens of E. sibiricum reach up to 4.5 m (15 ft) in body length with shoulder heights over 2 m (6 ft 7 in) while E. caucasicum reaches at least 5 m (16 ft) in body length with an estimated mass of 3.6–4.5 tonnes (4–5 short tons). 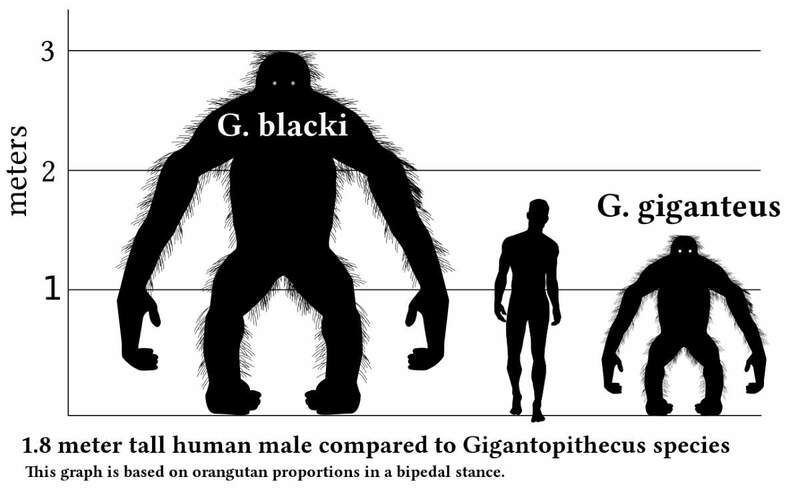 The largest known primate of all time was Gigantopithecus blacki, standing 3 meters tall (10 ft) and weighing up to 540 kilograms (1,200 lb). 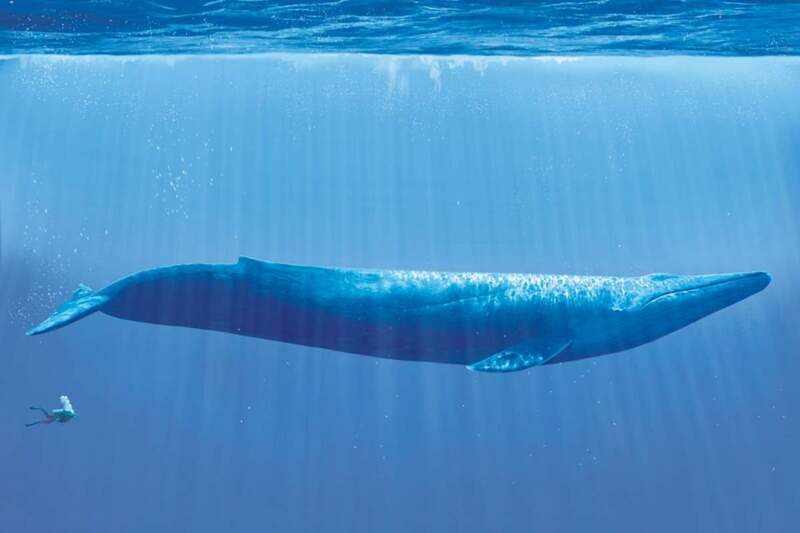 The extant blue whale is the largest and heaviest animal known to have existed, it is bigger than any animal that lived on earth, including dinosaurs. They grow up to 112 ft (34 meters) in length and 190 t (210 short tons) in weight. Some Pliocene age baleen whales (the Blue whale is also a baleen whale) were likely rivaled the modern blue whale in size – but they were still slightly smaller.